Kitchen gardens can be established and maintained on a small patch of land with minimum technical inputs; hence, these gardens have the potential to ensure food for the resource-poor marginalised rural households in India. It provides them a platform for innovations in supplemental food production as well as an opportunity to improve their livelihoods. Family labor, especially efforts of women, become particularly important in the management of these gardens. Empowered with reasonably minimum amount of skills and knowledge, these women can easily fight crop losses and other negative implications, thereby making kitchen gardening a profitable initiative. Besides, the major use of organic farming practices make these gardens environment friendly as well. Sehgal Foundation promotes the small kitchen garden model with the aim to improve nutrition security and supplement household income. The primary rationale behind this model is to help improve the nutrition status of small and marginal farmers and their families, providing them with an assorted mix of vegetables for a considerable stretch of the year. Kitchen gardens are cost-effective, practical and easily meet the balanced dietary requirements of rural households as well as add to the family income. Crops are selected considering the prevailing food habits and climatic conditions of the implementation areas, and with the larger goal of ensuring availability of wholesome and nutritious food. In 2017, Sehgal Foundation distributed seed kits, consisting of ten types of vegetable seeds, to almost 600 families in Samastipur and Kalyanpur blocks of district Samastipur, Bihar. The cost of one vegetable-seed kit is Rs 135. 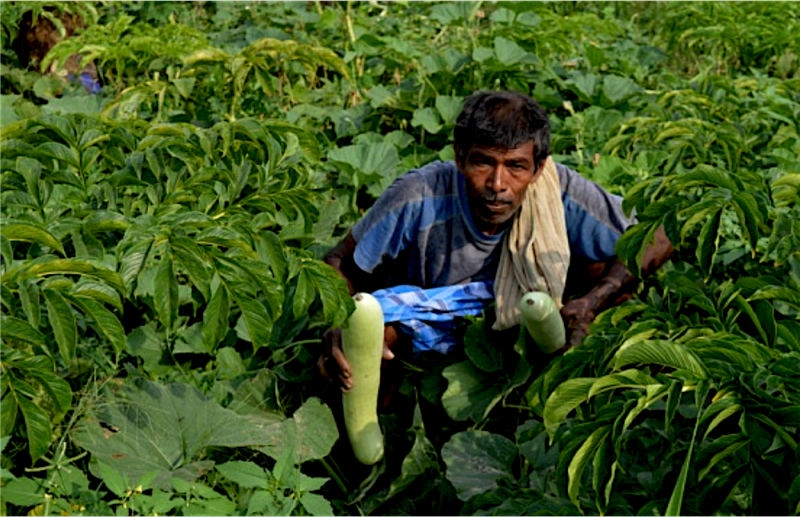 The kit consisted of the following crops: Bhindi (Lady Finger), Lauki (Bottle Gourd), Baingan (Brinjal), Barbatti (Cow Pea), Kheera (Cucumber), Lal Saag (Amaranth), Mooli (Raddish), Karela (Bitter Gourd), Shalgam (Turnip) (Beets) and Nenua (Ridge Gourd). Kitchen gardens help in increasing household income either by sale of the food products grown in the gardens or by the consumption of the same food items that the families would have otherwise purchased from markets using a significant portion of the family income. As mentioned earlier, in early 2017, Sehgal Foundation distributed kitchen garden seeds to 600 families, 95 percent of which included women community leaders in Kalyanpur and Samastipur blocks of district Samastipur, Bihar, all of whom have benefitted economically from the initiative. The plants in the kitchen garden harvested for approximately seventy five days saving Rs 50 per day for each family on an average. This ultimately led to a saving of approximately Rs 3750 per family. For rural resource-poor families, the economic benefits of kitchen gardens are beyond simple food production and subsistence. Apart from income generation and household economic welfare, this initiative promotes entrepreneurship, especially among women. Nonetheless, the earnings from the sale of kitchen garden products and the savings from consuming home-grown food products create an increased amount of disposable income for the beneficiary families, who invest the surplus income to fulfil other domestic requirements including purchase of additional food items, greater investment in education of children, and others. Kitchen gardens directly contribute to household food security by increasing availability, accessibility, and utilization of food products. Food items produced in kitchen gardens add to the family nutrition substantially, which directly leads to reduction of food insecurity. The experiments of Sehgal Foundation with regard to kitchen gardening in Samastipur point out that the initiative reduces hidden hunger and also curbs the possibilities of suffering from diseases caused by micronutrient deficiency by ensuring a small but continuous flow of subsistence food products in the daily household diet. Adequate nutrition is not only dependent on the quantity of food available. The seed kit provided by the foundation ensures a range of essential micronutrients like proteins, carbohydrates, vitamins, magnesium, iron, folate, manganese, zinc, potassium, sodium, calcium, fibre, phosphorous etc. for the beneficiary families. By distribution of seeds to 600 households in Samastipur, Sehgal Foundation encouraged its women community leaders to be actively involved in contribution of women in household food production has increased manifold, at times even making them the sole care takers of these gardens. However, food items produced in kitchen gardens; developed by women community leaders in Samastipur, act as a supplement to the actual food consumption of their households. Yet kitchen gardens improved women’s social status as well as their awareness with regard to the importance of a nutritional diet for their families. For some of these women, sale of their garden products in the local markets is a remarkable source of income as well. This enhances their status within the family and in the society at large as well. Kitchen gardens can also be a very good option for pregnant women who are not supposed to do heavy manual field work or spend long hours with insufficient food intake in order to ensure physical safety of the mother and the child. Additionally, the new-born infants need regular breast-feeding and attention. After months, a child needs more than breast milk alone and complementary foods need to be provided. Being at home during these months, investing time in kitchen gardening, thus provides women with income generation to some extent; also nutrient rich kitchen garden products have the potential to ensure food and nutritional safety of growing children. Majority of the households, who are beneficiaries of kitchen garden initiative in Samastipur, use organic methods of cropping including organic manure. Lesser dependence on chemical fertilisers and pesticides automatically make kitchen gardening an environment friendly initiative. In addition to this, kitchen gardens provide environmentally sound opportunities for waste disposal. Composting is commonly used for household wastes including kitchen waste, paper, and even animal waste, which are used to enrich the soil.